A multi-cloud strategy is ideal for companies looking to easily capitalize on SaaS or PaaS features without having to build and maintain infrastructure. But increasing application independence from infrastructure can offer a lot more than just increased flexibility and agility – it can inspire a net new approach to agile development fixated on business value. Intel IT came to this realization, and quickly began shifting their development methodology from an “infrastructure up” to an “application down” approach. What does this approach entail? 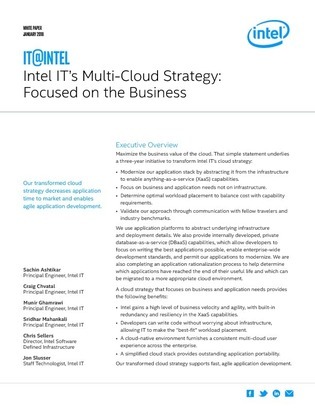 Straight from the key team of Principal Engineers at Intel, learn how they were able to successfully reform their cloud computing strategy, retraining its focus from meeting infrastructure needs to those of the business and its applications.